I love the Carolina STEM Challenge Competition, it gives my students a chance to [be] engineers and think. Carolina Biological Supply Company, in partnership with the North Carolina Science Festival, is pleased to announce the results of the 3rd annual Carolina STEM Challenge Competition. The winners of the 2015 competition were selected from more than 100 classrooms in 86 cities across North Carolina. “Since the start of the competition in 2012, we have continued to be amazed by the dedication, hard-work, and ingenuity of North Carolina teachers and students. We look forward to judging the videos each year and are always impressed by the quality of entrants” stated Mark Meszaros, VP of Product Management and Innovation for Carolina Biological Supply Company. The North Carolina Science Festival, an initiative of the University of North Carolina at Chapel Hill's Morehead Planetarium and Science Center, is a multi-day event focused on showcasing science and technology throughout the state. The Carolina STEM Challenge Competition, held in conjunction with the Science Festival, invites North Carolina middle and high school classrooms to design and build solar, mousetrap, and balloon-powered race cars. Josey Thompson, science teacher at Rochelle Middle School in Lenoir County remarks “I love the Carolina STEM Challenge Competition, it gives my students a chance to [be] engineers and think. They enjoy the challenges and figuring out how to make the cars work”. From its beginnings in 1927, Carolina Biological Supply Company has grown to become a leading supplier of science teaching materials. Today, from its headquarters in Burlington, North Carolina, Carolina serves customers worldwide, including teachers, professors, home-school educators, and professionals in health and science-related fields. 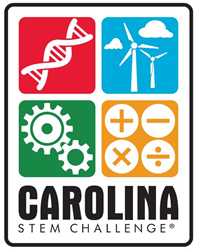 Please visit our website http://www.carolina.com/stemchallenge to learn more about the Carolina STEM Challenge® Series.